In the program's second-year, students follow a professional production cycle through courses in producing, directing, and production management. Students develop a script from pitch outline to shooting script over 12 weeks working through courses in producing, directing, and production management to develop a Producer’s Pitch Book, a Director’s Look Book and a Production Book based on a short script. 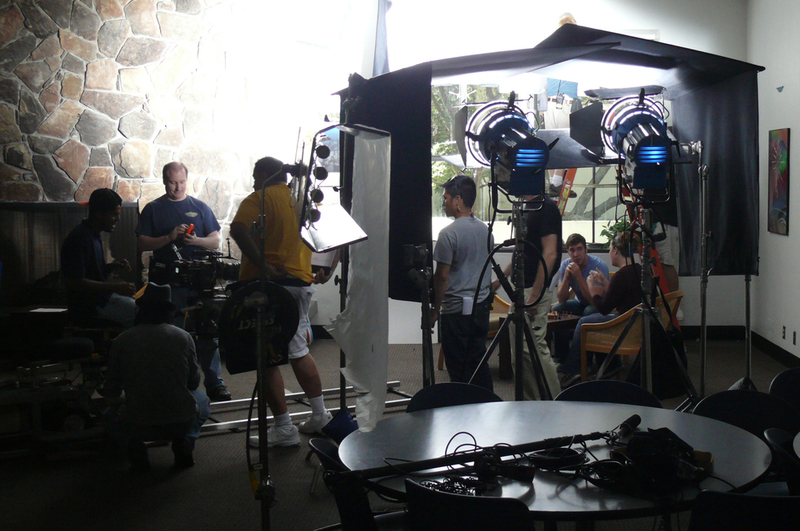 In the Production Management course students are assigned the roles of producer, line producer, director, cinematographer and production designer and use digital technologies and collaborative workflows to complete pre-production, including, casting, location scouting, production and cinematic design, and digital storyboarding for the film. The second year production residency is held each year in July in an intensive, one-monthon-site workshop and practicum format at the National University learning center in Los Angeles. The production residency features master studio workshops with film professionals such as a DGA director, an ASC cinematographer, an assistant director, and sound and editing professionals and seminars in 4K production workflow, directing actors, blocking, production scheduling and on-set protocols. During the first week students also work collaboratively in their production team completing preproduction prep, hold rehearsals, scouting locations, prepare shooting plans and secure film permits, insurance, and equipment. Production is scheduled for the second week of July. Digital Cinema MFA production fellows work on set in their leadership positions and in other crew capacities with a mix of professional mentors, faculty, and production crew interns drawn from production certificate programs in LA. A typical residency film is shot over two to four days on a 4K digital cinema camera, working with professional actors and a complete film crew. Editing and Post production takes place the last two weeks of the month. Each student edits her/his own version of the film, following a professional 4K cinema post-production workflow: syncing dailies, rough assembly editor’s cut and director’s cut, locking picture, sound design/mixing, color correction and final conforming. On the last day of the residency the film is shown at a Hollywood film studio screening room. We will bring forward some of the latest research on the job prospects and recommended criteria for applicants. What does it take to be a film Producer? What does it take to be a film Director? If you would like to get a Digital Cinema MFA program application, please fill out the form below and tell us a a little about yourself in the Message box. Please select an interest from the drop down menu.